A new detachable chairlift recently opened to the public in the French ski area of Les Sybelles. An inauguration ceremeny was held on 9 March and attended by Alexandre Maulin, President of Domaines Skiables de France. 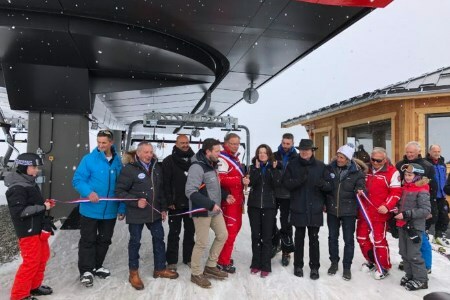 The €7 million chairlift, manufactured by BMF France, enhances access to the Pointe de l’Ouillon (2431 m above sea level) and links six stations: La Toussuire, Bottières, Le Corbier, Saint-Jean-d'Arves, Saint-Sorlin-d'Arves and Saint-Colomban-des-Villards. Maulin announced at the inauguration that a further three chairlifts would be constructed over the following three years to further improve access to the Ouillon area.